Southern California (February 12, 2019) — The Southern California CityPASS® program recently transitioned to a build-your-own custom experience that allows travelers to create their ideal vacation by fashioning a discounted, tailor-made ticket package to any combination of the following top attractions. The Disneyland® Resort (Disneyland® Park and Disney California Adventure® Park), where the highly anticipated Star Wars: Galaxy’s Edge—a new land featuring rides, entertainment and characters inspired by the “Star Wars” movie franchise—is scheduled to open in summer 2019. Universal Studios Hollywood™, where the magic of movies comes to life in such innovative attractions as "The Wizarding World of Harry Potter," the highly anticipated epic adventure "Jurassic World—The Ride" (opening this year), and the world-renowned Studio Tour, which offers guests a front-row seat to behind-the-scenes movie and television production. SeaWorld® San Diego, where rides, shows, tours and attractions dazzle both thrill-seekers and animal lovers. And just in time for summer 2019: Guests can experience Tidal Twister, the world’s first-of-its-kind horizontal, dueling roller coaster. LEGOLAND® California Resort, designed for kids ages 2-12, features more than 60 rides, shows and attractions. Its newest ride, LEGO® City: Deep Sea Adventure, immerses guests in an underwater submarine adventure. The park is also celebrating its 20th anniversary in 2019T. Ticket options include LEGOLAND Park, SEA LIFE® aquarium and the seasonal LEGOLAND® Water Park, plus discounts at LEGOLAND Hotel and LEGOLAND Castle Hotel. San Diego Zoo® or Safari Park: Choose the San Diego Zoo and get unlimited use of the Guided Bus Tour, Kangaroo Bus and Skyfari® Aerial Tram OR pick the San Diego Zoo Safari Park, featuring unlimited rides on the Africa Tram plus all shows and exhibits. 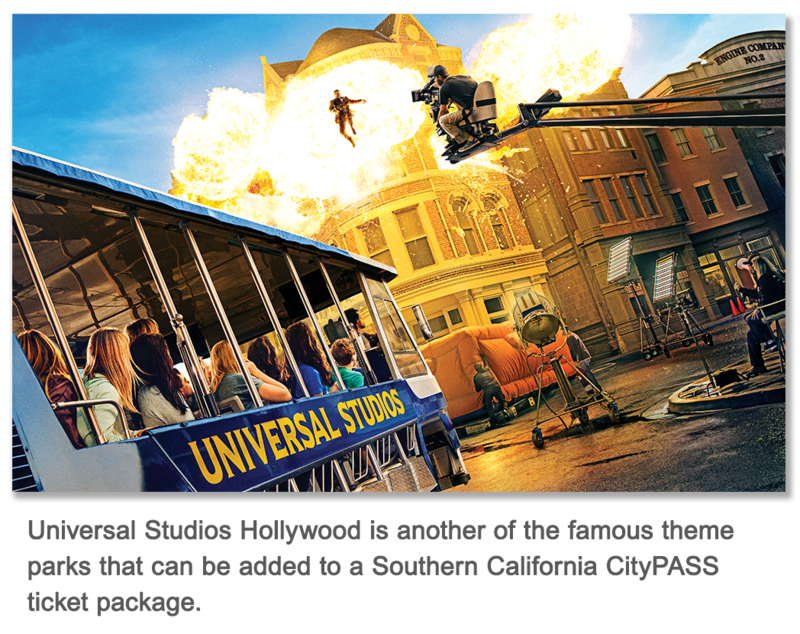 Designed by CityPASS, the company that has specialized in bundling discounted admission to the most iconic attractions in North America for more than 20 years, the original Southern California CityPASS program debuted in 2003. It quickly became an attractive option for budget-savvy families planning theme park getaways to the Golden State. Now, evolving technology allows CityPASS to offer its Southern California customers the most customizable travel experience possible. Upon visiting the Southern California page of the CityPASS website, travelers select the parks and tickets they want to include. Their tailor-made, direct-to-the-turnstile tickets are then delivered via email and can be saved to a mobile device or printed out for added convenience. Southern California CityPASS prices and savings vary, depending on the number of parks and types of tickets chosen. For more information, visit citypass.com/southern-california. About CityPASS: For more than 20 years, CityPASS tickets have been premier products for travelers who want to visit a destination’s top attractions while enjoying significant savings. CityPASS tickets, which have a 97 percent customer recommendation rating, are currently available in 14 North American destinations: Atlanta, Boston, Chicago, Dallas, Denver, Houston, New York City, Orlando, Philadelphia, San Francisco, Seattle, Southern California, Tampa Bay and Toronto. For more information, visit CityPASS.com. Prices, savings and programs vary depending on selected tickets. CityPASS® is a registered trademark of City Pass, Inc., and the exclusive property of City Pass, Inc.